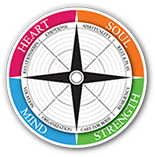 Take the self-assessment to find out if your life is heading in the direction you desire. Sign up for Weekly Words of Wellness from Samaritan Family Wellness Foundation written by the Rev. Dr. Scott Stoner. The benefits of creating an account are that your self-assessment results will be saved. This allows you to refer back to your results at any time by logging in. If you take the self-assessment again in a few months you will be able to compare your results to previous self-assessments.